One of my favorite pastimes recently has been turning fussy, traditional dishes into simple casseroles. As a working mom, I don’t have hours to spend working on dinner. I know, my job is creating, cooking and photographing recipes, but let’s be realistic here, no one has time to spend 3 hours making dinner. Since we’re all big stuffed pepper fans, I thought I’d try to turn our favorite stuffed pepper recipe into a casserole. It would keep all the same delicious flavors and textures that everyone loves, but it would be much easier and faster to put together. And let me tell you, it turned out to be a fantastic idea! Whenever I rework one of our favorite recipes, it’s vital that it turns out with the same flavors as the original version. Sometimes it doesn’t but it’s still good and a new recipe is born. But with stuffed peppers, I just wanted an easier way to make up our favorite recipe. Stuffed Peppers is just like meatloaf. There are about 1000 ways to do it and each one turns out a little different. Everyone has their favorite, and it’s usually the one that they grew up eating. Some have tomatoes or tomato paste and some don’t. Other have rice as a filler, others have oatmeal, and some have croutons. 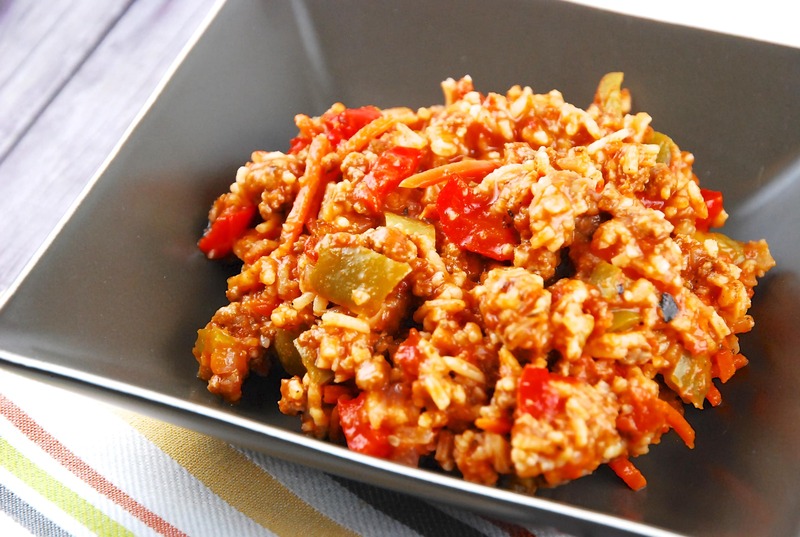 My stuffed pepper recipe is pretty basic, but I’ve made it a little more Weight Watcher friendly by using ground chicken breast instead of ground beef. It keeps the points down, but also keeps the flavor lighter so that the flavors of the peppers can really shine through the dish. In addition to the ground chicken breast, I season my peppers with onion, garlic, tomatoes and tomato sauce. I add some thyme, paprika and Worcestershire sauce to jazz it up and then some rice to add filling to the peppers. All those ingredients are crucial in my new casserole, so I didn’t change anything but the way that I cooked it. Instead of making the stuffed pepper filling and baking the peppers, I just chopped up the peppers and mixed it all together into a casserole. You guys – brilliant idea. You still get all the wonderful flavors of the stuffed peppers, but it’s so much easier to make and, frankly, easier to eat too. Since the peppers are all chopped up in the casserole, you get a little pepper in each bite and it’s perfect. I just loved how easy it was. I prepared everything, popped it in the oven and I was free to do other things until it was ready to come out. Then, to make things even better, I decided to use it as a meal prep recipe as well. It was easy to portion out the correct serving size into individual containers. Finally, I just had to freeze it and I’ve got an easy, healthy and delicious meal whenever I need it. This Stuffed Pepper Casserole was delicious, satisfying and low in points. It was easy to make and since everything is cooked in one dish – easy to clean up as well. We’ll definitely be adding this one to the regular rotation around here! All the great flavors of stuffed peppers without the hassle and fuss. A super simple Weight Watches dinner recipe for busy weeknight evenings. In a large skillet, heat oil over medium high heat. Add in onions and garlic, and sauté until tender, about 2 minutes. Stir in ground chicken, and cook until browned, about 5-7 minutes. Add in bell peppers and salt & pepper, and cook until softened, about 5 minutes. Reduce heat to medium. Stir in tomatoes, tomato sauce, broth, Worcestershire sauce, honey, vinegar, thyme, and paprika. Stir well, and heat until boiling. Add uncooked rice. Return to boiling; reduce heat to low. Cover and simmer about 25 minutes or until rice is tender. Season with additional salt and pepper as desired. Wow, thank you for this recipe – it is absolutely delicious! This will be in rotation for absolute sure! I did make a few changes – I used 93% lean ground beef instead of chicken, I used brown basmatti rice – a little healthier than white rice and to make it more substantial, I added one can rinsed navy beans. With or without my changes, this dish is FANTASTIC – thank you for sharing!!! I am just about to make the Stuffed Pepper Casserole, and wondering if you mean “saute” in the Step 1, rather than “sauce”. Thanks for all your good ideas and recipes. Yes! Thanks for catching that typo! This sounds really good, but it is NOT a casserole…. this is a skillet dinner… I may try to print it out as I’ve tried in the past, but your website is not user friendly and it’s next to impossible to print a recipe off of your website… and what’s worse, you seem to have no interest in fixing it… it’s ok, because I have several WONDERFUL WEBSITES, that have great recipes!!! OMG How rude can you be!!!! I have issues with printing as well, but I find a way to copy and paste it to a word document. It is NOT that difficult!! For all the hard work and effort she puts in to creating and sharing these recipes with us – you should be grateful! Go to your OTHER WONDERFUL WEBSITES then….why stick around here?? WHY?? Because the recipes are great! OMG, shall she come to your house and cook it for you too? Just copy and paste to a word document. I do this and save the recipe. It’s not that difficult. I have tried several recipes from this site and they are all delicious! Don’t rag on this poor lady because you are inept at technology. Truly, the more I see of people the more I just want to stay home with my dogs. Thank you for this site; I like many others appreciate your efforts.